WALLOPS ISLAND, Va. -- A diminutive NASA satellite is wrapped inside the nose cone of a five-stage Minotaur 5 rocket on an austere launch pad on the rural Virginia coastline, ready to begin a circuitous journey to the moon on a $280 million mission to answer enduring questions about the tenuous lunar atmosphere. Scientists hope the Lunar Atmosphere and Dust Environment Explorer, or LADEE, will also solve a 45-year-old mystery - a predawn glow over the lunar limb first spotted by NASA's early moon missions, then recounted in journals recorded by Apollo astronauts. And if that's not enough technology packed into the 7.7-foot-tall LADEE spacecraft, the mission will take a key step toward overhauling the way NASA communicates with its deep space missions, potentially leading to a type of interplanetary fiber optic network allowing high-definition video and mounds of data to stream back to Earth from rovers on Mars, manned missions visiting asteroids, and probes to other far-flung destinations. "The LADEE mission is going to give us whole new vistas on our nearest neighbor, and I'm very excited about that," said John Grunsfeld, associate administrator for NASA's science mission directorate. 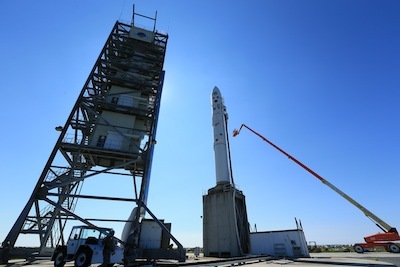 Scheduled to blast off at 11:27 p.m. EDT Friday (0327 GMT Saturday), the bullet-shaped LADEE spacecraft will soar to space at the tip of a Minotaur 5 rocket. 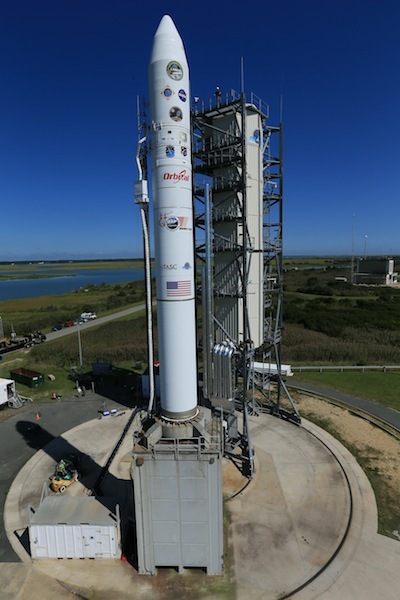 The 80-foot-tall rocket is sitting on launch pad 0B at the Mid-Atlantic Regional Spaceport, a complex leased and operated by the Virginia Commercial Space Flight Authority at NASA's Wallops Flight Facility. The Minotaur 5 is an extended version of the smaller Minotaur 4 booster, and while all the components of the five-stage rocket have been tested in flight, they have never flown together in this configuration. Powered by decommissioned motors from the U.S. Air Force's Peacekeeper ballistic missile program, the Minotaur 5 will rapidly depart the Virginia launch site, illuminating surrounding marshlands as it races east over the Atlantic Ocean. The fiery nighttime launch should be visible along the U.S. East Coast from New England to South Carolina, and to observers as far inland as Pittsburgh. 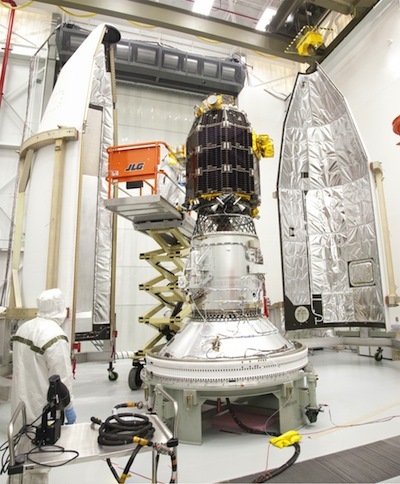 Climbing and accelerating over the Atlantic, the Minotaur will fire each of its five solid-fueled motors before releasing the 844-pound LADEE spacecraft over Africa about 23 minutes after liftoff. The Minotaur 5 will deploy LADEE in a lofty elliptical orbit carrying the small satellite as far as 172,000 miles from Earth. After controllers activate LADEE and check its health, LADEE's liquid-fueled propulsion system, procured commercially from Space Systems/Loral, will fire up to three times to raise the craft's orbit high enough to be grasped by the moon's gravity. "[The moon] swings by, whips us around behind it, and then once we come out from behind the moon, we do a big braking burn with our main engine," said Butler Hine, LADEE project manager at NASA's Ames Research Center in California, which led the mission's design and development. 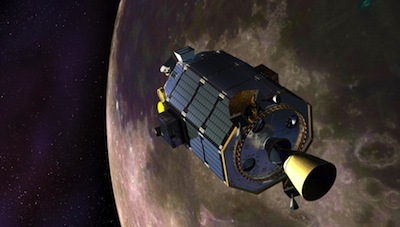 If LADEE launches on time, the craft should enter lunar orbit in the first week of October. The exact timing of LADEE's maneuvers to reach the moon will hinge on the performance of the Minotaur 5 rocket. Slight deviations in the orbit achieved by the Minotaur rocket could slide LADEE's lunar arrival earlier or later, Hine said. LADEE will initially slip into a unique equatorial orbit about 156 miles above the moon, where the satellite will switch on its laser communications package to begin a 30-day test campaign with a network of ground terminals in New Mexico, California and the Canary Islands. The laser communications demonstration is a secondary objective for the LADEE mission, but its importance is not lost on top NASA officials. "I'm a huge fan of laser communications and one of the reasons is that as you go farther out into the solar system, it's a much more efficient way to get high bandwidth communications at low power," Grunsfeld said. The Lunar Laser Communications Demonstration will try to transmit data through a four-inch laser beam fired from terminal mounted on the body of the LADEE spacecraft. When the beam reaches Earth, it will paint an area more than 3 miles across. Laser communications have tighter pointing requirements than traditional radio systems, but a futuristic laser linkup needs less power and less mass than conventional radios, according to Don Cornwell, manager of LADEE's laser payload at Goddard. And the laser communications system on LADEE should transfer at a rate six times higher than radios, Cornwell said. Officials project the laser system will beam 622 megabits per second of data from LADEE to Earth, and the uplink to LADEE will facilitate a bandwidth 20 megabits per second. LADEE will not actually transmit any valuable science data during the 30-day test, but future missions could rely on similar technology to broadcast high-definition video, 3D imagery and other data-intensive products. "Laser communications get more attractive compared to radio as you go farther in the solar system," Cornwell said. "We hope to use these systems from Mars one day." The ultraviolet and visible light spectrometer, led by NASA's Ames Research Center, will remotely sense any dust, including hydrated material like water and the compound hydroxyl, lofted above the moon's surface and determine the composition of the lunar atmosphere. The neutral mass spectrometer will measure chemical abundances in the lunar atmosphere and allow scientists to study the processes driving the tenuous atmosphere. The neutral mass spectrometer is led by NASA's Goddard Space Flight Center in Maryland. The lunar dust experiment will collect impacts of dust particles to analyze their size and composition. The payload is led by the University of Colorado at Boulder. Then comes LADEE's 100-day science mission, in which the small orbiter's instruments will scoop up dust particles, identify the chemical make-up of the moon's atmosphere, and look for signs of hydrated compounds, such as water and hydroxyl (OH), migrating from the moon's middle latitudes toward polar cold traps in permanent shadow, where scientists say ice can sit undisturbed for billions of years. "LADEE has two main science goals: To understand the lunar atmosphere as well as the dust environment around the moon," said Sarah Noble, LADEE's program scientist. After lowering its orbit for the science phase of its mission, LADEE will dip as close as 12 miles to the moon, skimming mountaintops and sampling material just above the lunar surface. The moon's atmosphere is not what you may envision, Noble said. Its atoms never collide, technically making the lunar atmosphere an exosphere. To get even more specific, the moon has what is called a surface boundary exosphere, a type of nearly airless atmosphere in which the exosphere extends to a body's surface and interacts directly with soil and dust. The moon, Mercury, the moons of other planets, and even large asteroids harbor surface boundary exospheres, making it the most common type of atmosphere in the solar system, Noble said. Previous research shows an isotope of argon called argon-40 is pushed high above the moon's surface when excited by the heat of a lunar sunrise. Scientists also think the solar wind and impacts by asteroids and comets drive material off the surface to form part of the atmosphere. "The lunar atmosphere has hundreds of different components and very unique dynamics," said Greg Delroy, LADEE's deputy project scientist at Ames. Then there is the question of the dust believed to be responsible for the horizon flow witnessed by the Apollo astronauts. Is levitating dust really the cause of the glow, and how does it get suspended tens of miles above the moon? LADEE will try to find out. Delroy said meteor bombardment may be responsible for the presence of dust so far above the surface. The LADEE science team has asked amateur astronomers to monitor the moon for impacts, which could help researchers determine whether a strike causes any change in LADEE's dust readings. Some type of so-far undetected static charge on the moon could also be the culprit in the mystery of the moon dust. "There might be a static charge on the moon, and that area could change as different regions of the moon rotate in and out of sunlight," Delroy said. "That could cause an electrostatic force to act on dust." Noble said now is a good time to launch LADEE because the lunar atmosphere is so delicate it could be disturbed or altered, at least temporarily, by the spacecraft landings kicking up dust. It has been 40 years since the last Apollo landing, and several companies and countries are planning unmanned moon landings in the coming years. Scientists hope LADEE's results will shed light on mysterious atmospheres around other worlds in the solar system, such as Mercury. The advantage of studying the moon is scientists already have lunar samples and know the moon's composition. "The moon is an excellent place to start," Delroy said.